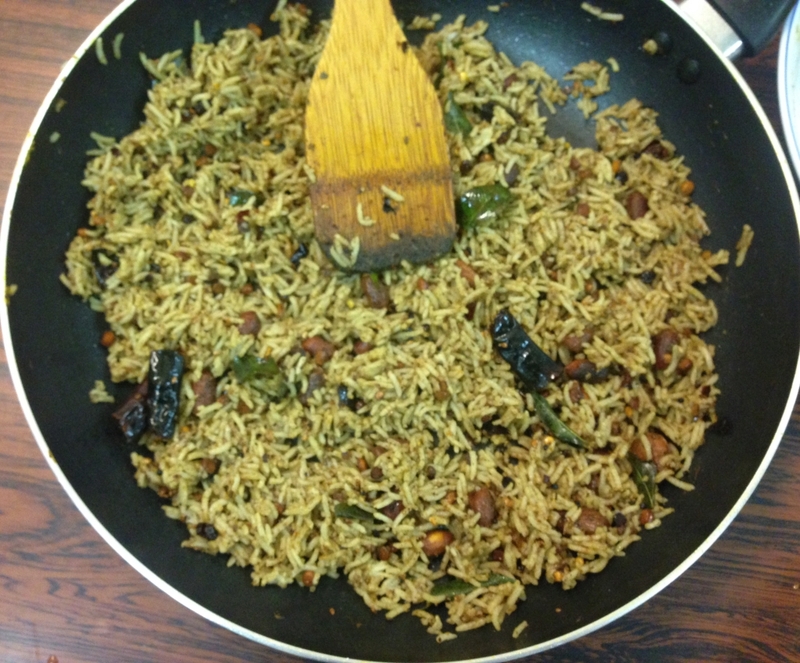 Tamarind Rice is a popular South Indian (Tamilian) dish also known as Puliogare, Puliyodarai or Pulikkachal. Tangy, mildly spicy and full of flavor, Puliogare is a common lunch option that’s quite easy to make at home. If you’re bored of the usual pulao, give this rice dish a go for a refreshing change. Notes: While boiling rice, take care that the rice grains don’t stick to each other. If you do not wish to use readymade tamarind paste, soak a lemon sized portion of tamarind in water for about 30 minutes, then squeeze it to extract its juice and discard the pulp. Prepare the spicy powder first. For this, heat cooking oil in a pan and add 1 tablespoon chana dal and 1 tablespoon urad dal to it. Roast for about 2 – 3 minutes. Add coriander seeds and 4 – 5 dried red chilies to the pan and roast everything for 2 – 3 minutes more. Now add fenugreek seeds and sesame oil and roast on low heat till sesame seeds sputter. Turn off the heat. Allow the mixture to cool & then grind it into a coarse powder. Now for the tamarind paste, heat sesame oil in another pan and add peanuts to it. Roast them until they change color lightly. Add mustard seeds, and when they crack, add both remaining dals, and fry for 1-2 minutes. Add remaining dry red chilies and curry leaves and fry for 1-2 minutes. Now add hing and turmeric powder and mix well. Finally add tamarind extract/paste and salt and mix well. Heat until the paste thickens and oil starts separating. To the pre-cooked or boiled cooled rice, add tamarind paste, and sesame oil (1teaspoon more, optional), and mix gently so as not to break the rice grains. Add coarse ground roasted powder and mix. Serve after 30 mins!